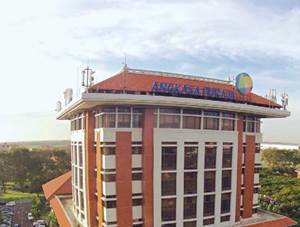 PT Angkasa Pura Solusi - APS or known as PT APSolusi is a directly-owned subsidiary company of state-owned airport operator PT Angkasa Pura II (Persero) that is involved in Airport Consultancy, Media, Supporting and IT. PT APSolusi has core business focus on passenger and baggage handling services, cargo handling services, property management, and information, communication and technology (IT). PT Angkasa Pura II (Persero) is the majority shareholder in PT APSolusi with a 99.997 percent stake. Other 0.003 percent shares in PT APSolusi was owned by Luthfi Edrus. PT APSolusi is based in Jakarta and its head office is registered at Terminal F Arrival Hall, Room F9P67 Soekarno-Hatta Airport Jakarta 19120. According to information found in the Company's website as cited by JobsCDC.com, PT APSolusi started its commercial operation in 1996 and initially registered as PT Angkasa Pura Schipol. The name of PT Angkasa Pura Solusi officially launched in 2011 after Schipol International BV agreed to transfer its 14,999 shares to PT Angkasa Pura II (Persero). Minimum D3 in any field with minimum GPA of 2.50, preferably from the Department of Language and Tourism. Physically healthy (not tattooed, pierced and color blind). Fluent in English is preferred (active). Have a high service soul (serviceful). Have a good communication and coordination. Free eye plus and minus from General Hospital. JobsCDC.com now available on android device. Download now on Google Play here. Please be aware of recruitment fraud. The entire stage of this selection process is free of charge. 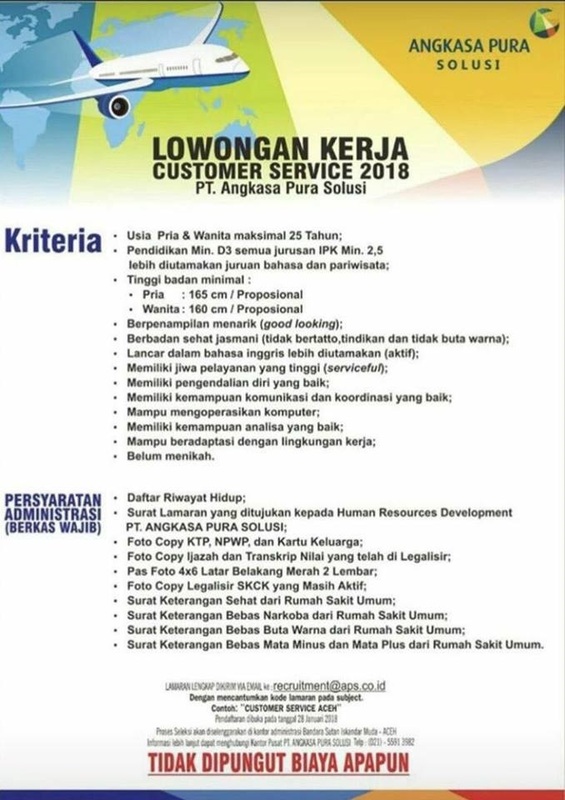 PT Angkasa Pura Solusi - D3 Customer Service Angkasa Pura II Group February 2018 will never ask for fees or upfront payments for any purposes during the recruitment process such as transportation and accommodation.